In recent years, hundreds of new synthetic recreational drugs have emerged – drugs that neither the general public nor the scientific community know very much about. Many of these new synthetic drugs – often referred to as “legal highs” – are dangerous and continue to lead to poisonings throughout the US and the rest of the world. These drugs provide similar highs to other, more well-known drugs, like marijuana and cocaine. Many are still legal and others have only recently become illegal. So why would people use these potentially harmful new drugs? Drug users in the US have a lot to fear. Users of various drugs have to worry that the products they are using may be adulterated. Many must worry about unintentional poisonings, and (depending on the drug) addiction, as well. But one of the biggest fears has nothing to do with safety or addiction. With illegal drugs, you are at risk for arrest. A drug-related arrest can prevent an individual from getting a good job, or from obtaining school loans or housing. The stigma associated with being a drug user can also serve as a major disruption to one’s life. A lot of people want to use or sell drugs, but fear repercussions. And that makes using or selling “legal highs” seem like a more attractive option. But “legal,” in this case, doesn’t mean safe or regulated. Legal synthetic drugs are usually so new that laws to prohibit their use simply don’t (yet) exist. Even though they may be “legal,” these drugs have not gone through safety testing and it’s hard to know what you’re getting, or even where it’s coming from. Synthetic cannabinoids (hereafter referred to simply as “synthetic marijuana”), are the most prevalent of these new drugs in the US. Cannabinoids are natural compounds in marijuana that act on specific receptors in the brain. THC, the main psychoactive compound in marijuana, is the cannabinoid largely responsible for getting users high. 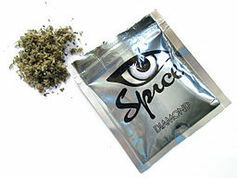 Synthetic cannabinoids mimic the effects of the natural cannabinoids in marijuana, but have been reported to be much stronger and much more unpleasant than real marijuana. Synthetic marijuana users rarely know what to expect because the products consist of untested research chemicals sprayed on an herbal mixture. It can be hard to know exactly where these drugs come from – but at least some are coming out of unregulated labs overseas. There are many compounds, mixtures and brands available and they aren’t very difficult to find. They’re widely available over the internet and also sold in some head shops throughout the US. Products come in catchy packaging under popular names such as Spice, K2 and Scooby Doo, and may be particularly appealing to young people. While some compounds are now illegal, they still remain available, and new synthetic (legal) compounds quickly emerge to take their place. Synthetic marijuana use has been associated with tens of thousands of poisonings throughout the US. Alarmingly, results from my study published earlier this week suggest that between 2011 and 2013, one in ten US high school seniors reported using synthetic marijuana in the last year. In fact, a couple of years ago synthetic marijuana was the second-most prevalent drug used by teens (after real marijuana). However, use has begun to decrease since 2014. New synthetic drugs are beginning to pop up everywhere. You might have heard of “bath salts,” which are compounds or mixtures of synthetic drugs like the stimulants mephedrone and methylone. New drugs such as bath salts are often sold over the internet with users informed that they are “not for human consumption.” Despite extensive media attention, (intentional) use is not very prevalent. Currently only about one out of a hundred high school seniors have reported use in the last couple of years. However, unlike synthetic marijuana, which is usually used intentionally, bath salts are often used unintentionally. In recent years, bath salts have been showing up frequently in the drug Molly, which is supposed to be pure MDMA (Ecstasy). As I’ve discussed in The Conversation and in The Independent, many Molly users in the US don’t know the purity of the product they are using. A lot of batches of Molly have little to no MDMA and users should be worried that their Molly contains more dangerous synthetic chemicals such as methylone. Despite decreasing prevalence in use, “Ecstasy”-related poisonings and deaths have increased in recent years, and it appears that this is a result, in part, of Molly being so adulterated with new synthetic drugs. It is difficult for users to test their drugs to ensure purity. Special tests are needed to determine which drug is which and testing tends to be very expensive. In fact, testing is so expensive and time-consuming that some autopsies of deaths related to use of new drugs are backlogged or do not include tests for all new synthetic drugs. Making things more dangerous for users, pill and powder testing at rave parties and festivals is discouraged because promoters worry that it will be viewed as condoning drug use or admitting that use is occurring at the party. So those likely to try these new drugs are often stuck gambling with their lives as it is so difficult to test their products. These new drugs are created in response to our drug policy and new drugs will continue to emerge. It seems that whenever we’re able to push one drug down, a newer, more dangerous synthetic drug, pops up to take its place.